There are many versions of this dish, but one common factor is that it always includes tomatoes. Apparently, Manhattan fish chowder was influenced by Portuguese immigrants in New York, who used tomatoes instead of cream common to the traditional chowder recipes (e.g. New England chowder). So is this soup low-carb? Almost – we just need to make one small tweak. Traditional recipes usually include potatoes. And you know what we do with recipes requiring potatoes – we just use cauliflower instead and never look back! Cauliflower does work perfectly in this recipe (and in most other soup recipes). It is a very good idea to eat soup regularly when on a low-carb diet (or any other diet). It is very filling but usually contains few calories/carbs. If you have some soup as a starter, you will eat a lot less of your main meal. What sort of fish and seafood should I use? One great thing about making fish soups or stews is that you don’t have to use fresh fish – frozen or even tinned works just as well. So unless you live on an ocean coast, you can easily get away with using a tin of fish for the stock, and frozen seafood instead of freshly-caught! You can use pretty much any combination of seafood – prawns, mussels, any other shellfish (shelled), chunks of squid would all work really well. If you are using cooked prawns or other cooked seafood, you won’t really need to cook them (that would just make them rubbery). 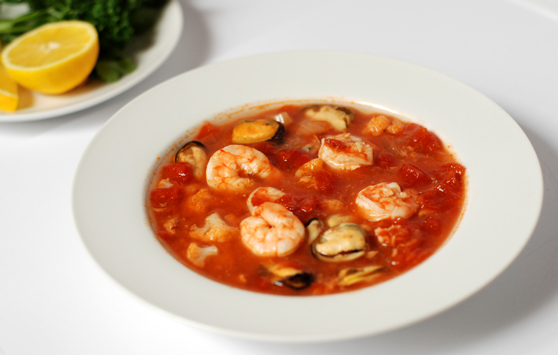 So add cooked seafood to your soup in the very end, when all other ingredients are ready and the soup has cooled down a bit. 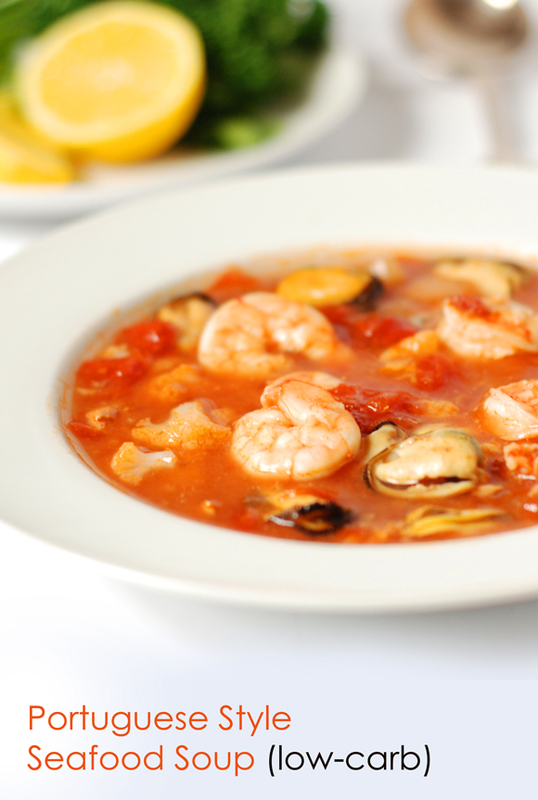 If using frozen seafood, defrost it first and add to the soup immediately after taking it off the heat. See the recipe below for more guidance. 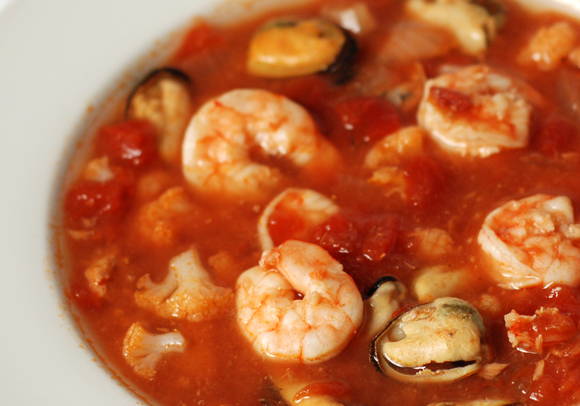 In my recipe below, I am using a can of salmon for fish stock, frozen prawns and Tesco ready-to-eat mussels. Optional – If you have the time and inclination, you can also make your own fish stock using any leftover fish bones (fish heads especially!) and/or prawn shells (again heads work really well). Add some bay leaf, peppercorns and salt and boil away for an hour or so! As above – fresh is great if you have some, but a can of chopped tomatoes will work just as well. Soup is a very forgiving medium! Scrumptious low-carb soup with seafood, cauliflower and tomatoes. Per serving: 2g net carbs, 4g fat, 16g protein and 115 cal.